You hold the key, I help you use it! You already know that life with anxiety is a life in prison. What you don't know is why you're stuck or how to break free. I work with people who are determined to breakout of anxiety prison and live their lives with freedom! For years, I too struggled with anxiety and panic attacks avoiding simple freedoms that most people take for granted. So much precious time wasted. ​I learned to turn fear into courage and so can you! As a psychotherapist and coach, I will support you using the same tools and strategies that finally worked for me. I offer unique and highly effective holistic programs. I look forward to speaking with you soon. You not only gave me the tools - you taught me how to apply them. How could I ever thank you enough for showing me how to take control of life? All of my most heartfelt admiration." ​"I wish I could put into words what you have done for me and the positive effect you have had on my life." "Coming here is one of the best decisions I ever made. I have seen progress I never knew I could achieve. I have the tools!" "You are a gem hidden in the Finger Lakes!" you think you can't... you are right." With Cognitive Behavioral Therapy (CBT), you will learn to understand how your thinking patterns contribute to your symptoms and how to change your thoughts to change your life. "Because anxiety really isn't just in your head." "Fuel yourself to escape anxiety prison, fuel others to never return." When we cultivate and nurture relationships, find a way to give beyond ourselves, pursue our dreams and goals THEN we are closing the door on anxiety. 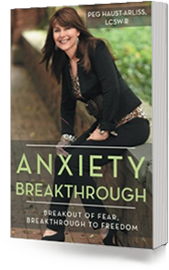 Peg's own struggle with anxiety lead her to be the specialist she is today. Now, the proud owner of Fear To Freedom Holistic Therapy and Coaching her thriving private practice helps many people create the life they deserve, not one on reserve. Located in the beautiful Finger Lakes area of upstate NY, Peg offers in person and online cognitive therapy as well as coaching for optimal wellness of mind, body and spirit!